Lately I saw a lot of people wearing flared jeans. Is this the new trend? I took my jeans out from the closet and put them on. The retro wind of the flared jeans brings me back in time and give me a warm feeling. 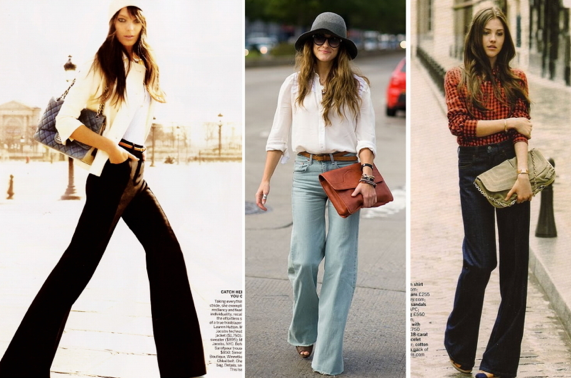 You wear flares perfectly! Loved them teamed with the stripes, so chic. I like so much your shirt. hey! great blog! following you! Currently following you, maybe we could follow each other if you like my blog. I LOVE flared jeans, so happy that they're back! Awesome outfit and great blog! Thank you for the comment and follow! I'm a follower too. thank you so much for visiting my blog and leaving me such a sweet comment! i totally love the high-rise bell bottom look that's so big right now. i started wearing mine again too! it's one of the look book on my blog. that sweater is soooooooooooo cute!! Your style is splendid. As if you've walked straight out of an editorial. * I am a fan of the wide legged denim- it's much more flattering and eye-pleasing then the skinny jean. love your pink and white stripes! i'll always love skinny jeans more, but i did just buy my first pair of flared jeans since middle school a few weeks ago...! what a beautiful blog and you got an amazing style! i'm following your blog via bloglovin and via blogger hope you can follow mine too!! So gorgeous! I love the crisp chic look! I love those jeans- makes me want to buy some! דרלינג, אהבתי מאוד את הג'ינס. מאיפה הוא?